For many, there will a come a time when they will decide that renting is no longer for them and they have decided to take the steps towards buying their first piece of property. If you are on the fence about purchasing because the thought of staying in one location for a long period of time scares you, there are mortgages that could accommodate you, but if you have been considering this for a long time and are ready… then congratulations! For a first time home buyer, I’m sure the question of whether buying a condo or buying a house has popped up in your mind before. “Should I buy a unit out of many in a building? Or should I buy a single family home?” There are several factors to consider such as the obvious lifestyle and location preferences of the prospective home buyer but there is also the cost of maintenance, rules of ownership, and the monthly fees that could be the decision maker. One choice is not necessarily better than the other and is not a measurement of the home buyer’s financial success. They just need to make the right choice for themselves. There are many benefits that come with purchasing a condo, the main one being the price. Condos usually have a more attractive price tag, but what are you really purchasing? 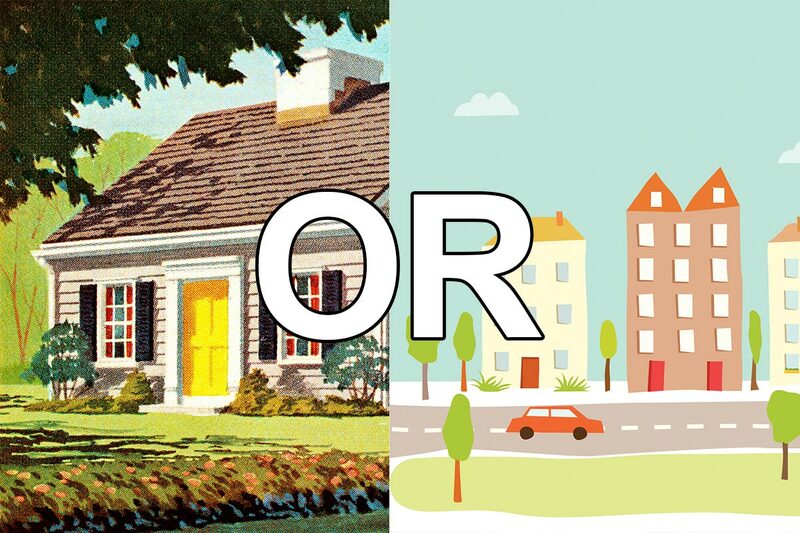 The most obvious difference is that a condo is smaller than a single family home. Condos are typically smaller than houses and they feel very similar to an apartment. While there is a difference in the size of the 2 types of residences, it doesn’t have to be a con. As many of us know, the longer you inhabit a space and the more room it has, more and more objects tend to build up and accumulate. This concept seems to be applicable to any type of situation such as your desk area at work, your car, your bag, etc. The same thing goes for your home. While houses can offer more storage space, there is also the risk of clutter and the collection of unnecessary things and because condos have less room, there is less opportunity for the buildup. Also, because the space of a condo is smaller, the cost of living is less. Aside from the price of the condo itself, condos usually have a HOA (Homeowner’s Association) fee that you need to pay in the form of a monthly fee in addition to your monthly mortgage payment. Saving money might have been one of the top reasons to buy a condo, so it is understandable that the additional fees could be a drawback, but these fees are primarily used towards building maintenance and to sustain the communal amenities that are also included with your unit for your enjoyment. What is a Homeowner’s Association? The Homeowner’s Association is a volunteer group that is comprised of the owners of the units and as a whole, they decide what areas of their complex need attention in order to preserve the property value. Because multiple families and parties live in the same complex, everybody is responsible for the maintenance of all communal areas such as the elevators, gym, swimming pool, landscaping, roofing, security, etc. While the purpose of the HOA is to maintain the quality of living for its community, they can sometimes be a hassle. With a house, the homeowner is 100% responsible for the maintenance of both the outside and the inside, including the backyard and lawn. A lot of the times, a professional service is hired to help with the upkeep or expensive tools are purchased to make the job easier. With a condo, the owner is mainly responsible for taking care of the inside of their unit. Paying HOA fees can eliminate the headache of having to figure out what needs to be fixed and it can be financially beneficial to you since all of the owners are required to pay the fees and the overall cost of repairs is split between all of the residents. There are rules that can be set in place and enforced by the HOA, which are comparable to the rules that an apartment renter must abide by. The HOA can decide if you are allowed to have pets and what kind of pet you are allowed to have, if you can have a satellite dish, if you can have a small garden, etc. HOAs aren’t only exclusive to condos, they also exist in gated communities and subdivisions with individual homes and they can dictate what color you want to paint your house, the type of cars that are allowed to park on the street, and even when they are allowed to be parked on the street. When looking at your options, it is important to consider if abiding by these rules will impact the quality of your life and to determine if spending the extra money to buy a house is worth it. Overall, houses do require a lot more effort, but the payoff can be worth it. You get to have full control of your property and aren’t required to seek the approval of an HOA. You can truly express yourself, decorate your home to reflect your personality and tastes, and reap the rewards that come with owning your own home. The cost of living in a house versus a condo is more expensive. Because the property itself costs more, you will have to get a bigger loan, which means the monthly payment will be more. It also means that the insurance and the taxes will be higher because if the property value is higher, the property tax is going to be more expensive. Because the property itself will have more square footage, there is now more to maintain, which will result in a slightly more costly utility bill. It is going to require more heat to heat up a larger area and if the house has a yard or a garden, it will need to be watered which will be reflected in your water bill. Where you want to live could also have a huge impact on your decision between choosing a condo or a house. If you want to live near a more city like atmosphere, a condo is much more convenient. They are usually built around urban areas and are in close proximity and walking distances to coffee shops, bars, restaurants, and other fun places. Since so many attractions are easily accessible, a car isn’t always necessary. With public transportation and ride share apps like Uber and Lyft, the need for a car is less. Also, because a car isn’t exactly necessary when you have almost everything within a mile radius of walking, it is possible that the parking situation associated with your complex might not be ideal. Your unit might only come with one parking spot and because of the urban area, the street parking can be a nightmare for any visitors that you may want to host, unlike a house in a residential area that comes with a driveway and more street parking availability. Living in an urban area may seem attractive to many mainly because everything is so close to you, but that can also be a con. Living in a condo is very much like living in an apartment unit, except that you are the owner of that property and so are your neighbors in your complex. Having neighbors in close proximity can create a sense of community, but having your own privacy is also important. Sometimes you just aren’t in the mood to have small talk while getting your mail. Furthermore, because your neighbor will most likely be a fellow condo owner, they probably don’t have plans to move out anytime soon. If they are the kind of neighbors that like to host karaoke competitions late at night and during the week, that is now going to be a part of your life too. With a house, there are yards and driveways that function as a divider between you and your neighbors which can provide you with a little more privacy that can go a long way. What if I Don’t Have 20% Saved? If you’re hesitant on buying a home because you have less than 20% of the home value for a down payment, there is the FHA Loan which allows qualified home buyers to purchase homes and put down as little as 3.5%. If later on in life you find yourself in an improved financial situation or your priorities have changed, you can always refinance into a different type of mortgage to better suit your needs. The option to refinance and change your mortgage will be there, so it is best to think about your long term happiness from the very beginning. The most important person you need to consult when deciding which type of property you want to buy is yourself. You shouldn’t have to compromise when buying a home. You are going to be the one to live there, so it is extremely important to put your happiness and well-being first. There are pros and cons to each type of residence and while it may be clearer to others which is a better choice, that doesn’t necessarily mean that it will be the best choice for you. If your finances are swaying your judgment, please keep in mind that there are a variety of mortgages out there to fit almost every type of lifestyle and situation. Use This Tool To Calculate Your New House Payment.